HARDWICK, Vt. (February 6, 2019) – Located in the rolling hills of northern Vermont, Caledonia Spirits® – the distiller of Barr Hill Gin, Barr Hill Vodka, and Tom Cat Gin – is expertly crafting some of the most unique, super-premium spirits in the country, and it’s doing so with raw northern honey as the backbone of every bottle. Founded in 2009 by Todd Hardie, a local beekeeper and farmer, Caledonia Spirits set out to create a gin unlike any other, blending raw northern honey with juniper to achieve a perfect balance of flavor. With quality ingredients and a connection to the land, the Barr Hill® brand was born – and so was its landcrafted® approach, which is at the core of everything the distillery does to this day. Now under the leadership of owner and head distiller Ryan Christiansen, who purchased the company in 2015, a growing team of hardworking Vermonters is carrying forward Caledonia Spirits’ original mission of building strong relationships with local farmers and beekeepers, creating quality jobs in the area, and raising awareness about the importance of bees and other pollinators. In fact, each September, Caledonia Spirits hosts Bee’s Knees Week, a philanthropic initiative that engages bars and restaurants across the country to raise awareness of the essential role that bees play in our environment. Built on a foundation of innovation and experimentation, Caledonia Spirits is pushing the boundaries of traditional distilling with its Barr Hill spirits. 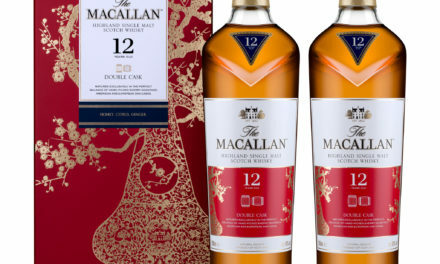 The distillery currently produces three truly unique, award-winning spirits for commercial distribution and is in the process of developing additional large-scale and limited-release spirits. Barr Hill Gin, the distillery’s flagship spirit, is the country’s fastest-growing domestically produced super-premium gin. A winner of 12 gold (or higher) medals, Barr Hill Gin celebrates the hard-working bees of the Northeast. The gin is distilled in Barr Hill’s custom-built botanical extraction still – named Irene, after the lead distiller’s late grandmother – and the floral depth of the raw honey acts to balance out the juniper-forward botanicals. The unique recipe and distilling process produces a gin with a distinctive, unparalleled flavor profile, as well as a beautiful golden hue from the honey. Thanks to a six-month aging process in new American white oak barrels, Barr Hill’s Tom Cat Gin is a revolutionary spirit that marries the best qualities of gin and whiskey. The robust character of the oak barrels mingles with the coniferous quality of the juniper to produce a wonderfully approachable spirit that can be enjoyed on its own or in a cocktail. Tom Cat Gin, which still features a touch of raw northern honey like Barr Hill’s other spirits, is the country’s top-selling barrel-aged gin. Rounding out the distillery’s current product line is Barr Hill Vodka, a truly extraordinary take on the widely popular spirit. Distilled solely from raw northern honey, the vodka is a tribute to the hardworking beekeepers who deliver hundreds of barrels of honey to Caledonia Spirits every summer. Since the spirit comes entirely from impeccably-flavored raw northern honey and not a cheaper sugar source like potato, Barr Hill Vodka is minimally distilled and filtered, unlike traditional vodkas. The end result is an exceptional spirit that is both flavorful and fragrant. Managing all of its production in-house, Barr Hill can be found in stores, bars, and restaurants across 26 states, from coast to coast, and is also available by special order in an additional six states. On a global level, the spirits are distributed to Puerto Rico, Canada (Quebec), Denmark, Hong Kong, and Japan. For online ordering or a full list of retail availability, visit the “Find Us” page on the distillery’s website, www.barrhill.com. Every bottle of Barr Hill comes sealed with real beeswax and features both the hand-written batch number and production year on the back of the label. Barr Hill’s website is an excellent resource for delicious cocktail recipes, and it’s also home to an online shop that features its very own raw northern honey, branded apparel, and barware. At the distillery in Hardwick, Vermont, tours and tastings are available, Tuesday through Saturday, between 12 and 5 p.m.
To keep up with demand and ensure all production stays in-house, Caledonia Spirits will move into a state-of-the-art, 26,000-square-foot distillery in Montpelier this spring. Barr Hill® is an award-winning, super-premium spirits brand, made by the Vermont-based distillery, Caledonia Spirits®. The distillery proudly operates under its Landcrafted® philosophy, skillfully and mindfully crafting its spirits with environmental stewardship in mind. 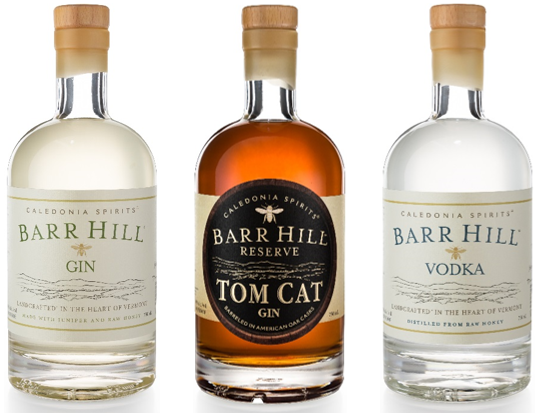 Barr Hill currently produces three spirits – Barr Hill Gin, Tom Cat Gin, and Barr Hill Vodka – and distributes to 32 states, along with Puerto Rico, Canada (Quebec), Denmark, Hong Kong, and Japan. The spirits are also available in another six states by special order. For more information on Barr Hill, please visit www.barrhill.com or follow the distillery on social media: Instagram (@barrhillgin), Facebook (@CaledoniaSpirits), and Twitter (@CaledoniaSpirit). 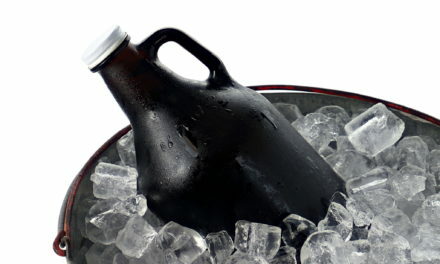 On the Growl: As the use of growlers increases, it’s important for producers to be aware of the rules.